Recently Sara asked me if I would like to take part in her first Dress Up Party blog tour. Throughout May Sara will be featuring guest bloggers reviewing their favourite patterns, and there are loads of prizes to giveaway. As I need absolutely no excuse to make a dress, naturally I said yes! 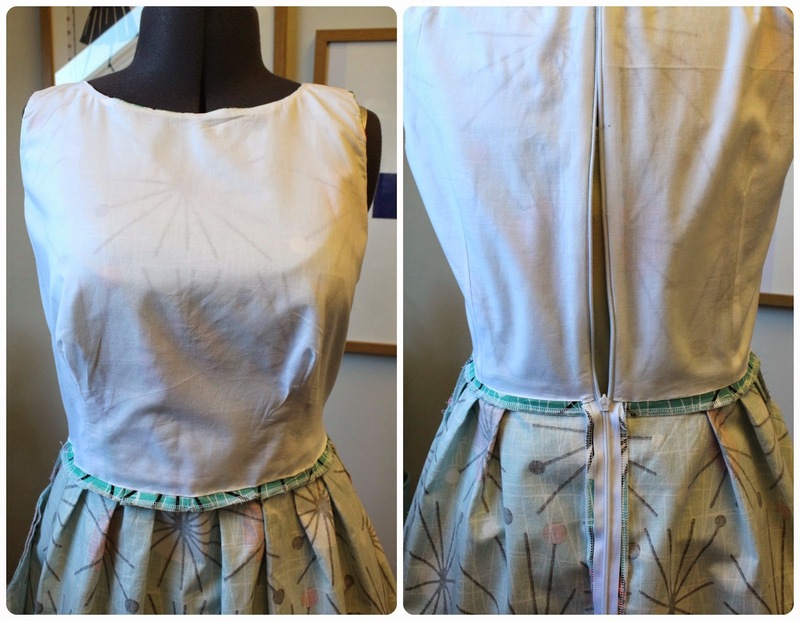 So now that Spring is finally here, it's time to start thinking about summer dress sewing. Naturally I have lots of dresses planned, but for my first one I thought I'd make my fourth version of Tilly And The Buttons Lilou dress. The other three are here, here and here. This one is closest to the original dress, as it seems that these days I can't leave a pattern as it is. I knew I would have to draft the bodice from my block due to my multitude of weird fitting issues, and I really was going to make it as it is on the pattern; but I wanted to try out a boat neck bodice, so that's what I did. I've taken the waist darts in a bit since these photos were taken, as the area under the bust was a bit too loose. I wish I'd thought about the print placement on the bodice back! I absolutely love how this dress turned out. 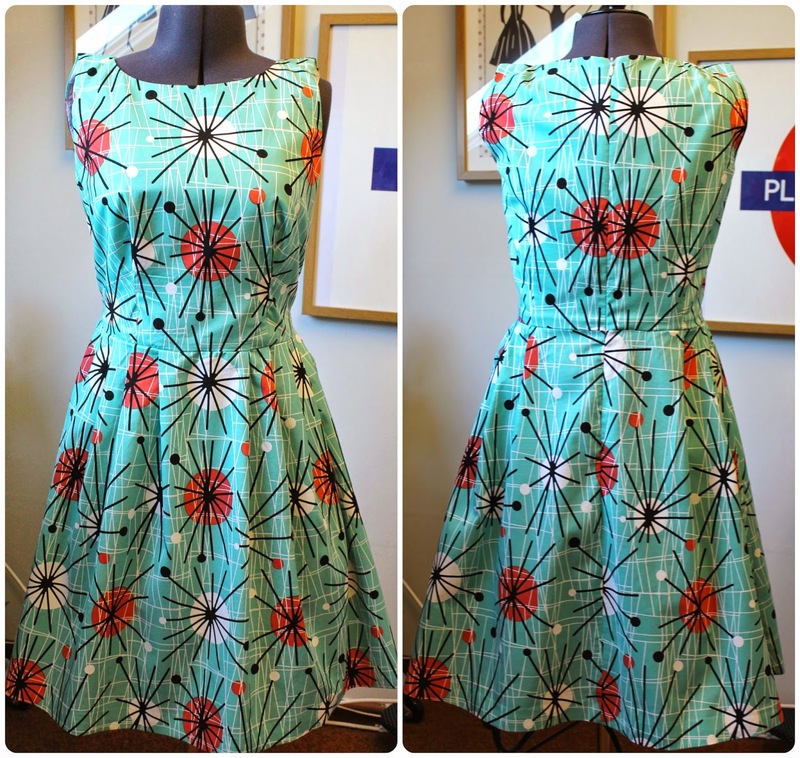 The fabric is by Michael Miller, and the print is called Atomic. I love this. I'm trying to be a bit more experimental with colours, and I think I got that right with turquoise and orange! It's 44 inches (112cm) wide, which is too narrow for the skirt pattern - the pattern instructions recommend using 60 inch wide fabric. 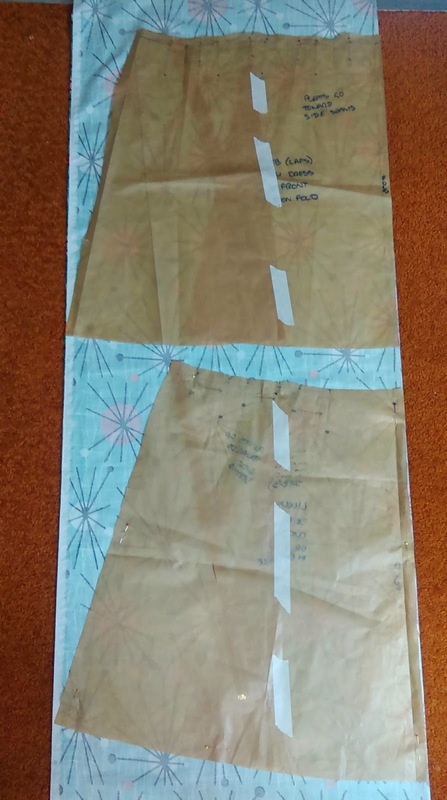 So I just narrowed the pattern pieces; here's how I did it - it's the same as on my Dolly-thorn dress. I folded each skirt piece in half longways. The corners of the hem and waist wouldn't match properly to allow them to fold completely flat, so I matched the hem corners together. Once it was folded flat, I cut along the fold line in the middle of the pattern. I left a little hinge at the top, and overlapped the hem until the pattern piece fitted onto the width of the fabric, then I taped the join with some masking tape. This means that I can open it out again to use as the original pattern piece again. You can see in the above photo where the pieces are taped back together down the centre. It throws the shape of the hem out a bit (you can see this more on the top pattern piece which is the skirt front), but it's easy to even up when hemming. Obviously, this will make the skirt less flouncey than the original, but it's still lovely and full. I also lined the bodice using some white cotton lawn; and in a fit of doing things properly, I actually followed the instructions in the book. I'm glad that I did, because it's a while since I lined a bodice, and I am particularly pleased with how the bottom of the lining attached to the dress. So that's Lilou number four! I hope you aren't bored of seeing me make this, but I really do love that skirt. I have one more planned; I really tried to talk myself out of it, but the fabric keeps telling me that that's what it wants to be! Love the colours - they really suit you. Looking forward to seeing your next version. Who are we to deny a fabric when it chosen its pattern? Thank you! The next version was finished a few days' ago, but to be honest, I'm a bit meh about it. I'm not in love with the fabric. Thank you! I do love this fabric! Oh I love that fabric! Not supposed to be buying any but I am v tempted! Thank you! I say - buy it!! I'm definitely not bored of seeing versions of this dress - I really like the Lilou pattern! The fabric you used here is great and the colours really suit you! Thank you! Lilou is such a great pattern. I think I've done all the versions that I want to now! Thank you! I'm very pleased with how the skirt turned out. If anything, I think it's actually more wearable being a bit narrower. As much as I love the original skirt, it is a lot of fabric! Great dress and fabulous fabric. I like the narrow skirt and the boat neck. Thank you! I do like how this boat neck looks. Another gorgeous dress. That fabric is great fun. And hey, Im not surprised you have made so many Lilou dresses, the shape is perfect for you - don't knock a good thing! Thank you! I just love the colours in this fabric, but I think I'm going to step away from the Lilou pattern for a while now! Do you add pockets to your Lilou skirts? I've got it in mind for a couple of bodice mix ups but need to get around to adding a pocket piece. Thank you! I did indeed add some pockets. I forgot to mention that! It's really easy to do, and I think the instructions are in the book with the Clemence skirt. Oh, Lynne, this is a stunning fabric, and you made a wonderful dress! Thank you! I was delighted with this fabric when I got it. This dress is so cute! I love the mid-century modern vibe of the print! Thank you! I love the print too, I thought it was quite 50s. Thank you! Isn't the print fab?! This is a cracker! You've tempted me to push Lilou up my queue of projects. The boatneck looks fantastic, I may have to steal that idea! Thank you! Lilou is such a great pattern, and steal away on the boat neck! It's gorgeous! The fabric, the shape! And I love that skirt at the front! Well done you... the front fabric placement is most important... but you were so close the back bodice! Next time! It's hard though right? Thank you! I could of kicked myself when I saw the back because I was so careful about lining up the print along the horizontal seams when I cut it. I coompletely forgot about the vertical seams on the back. But as I said to my sister, I won't see it when I'm wearing it, so it's grand!! Thank you! I'm delighted with the turquoise blue/green. I love this colour, and in my head, I thought I was too pale for it. The fit on you is spot on, I am in awe. Very well done! Thank you! You know what, I have your dress pinned on Pinterest! I had originally been looking for another fabric which was a similar colour - I can't remember what it was off the top of my head, but I couldn't get it. Then I found this fabric, and remembered your gorgeous dress. Great minds definately think alike! I really like these colours on you and their great colours for your warmer weather. Thank you! I think it's always great to have a tried and true pattern to fall back on. Especially when you're just in the mood to sew, and don't what to have do deal with fitting issues. Gorgeous fabric, such a fabulous retro look. Love it! Thank you! I love the retro-ness of it. Is retro-ness a word? It is now! I love the colours, they look so bright and happy. Thank you! That's a great way to describe the colours, they really are bright and happy. Thank you! I was delighted with how the skirt tuned out, and it was really easy to do. That fabric is amazing and the colour really suits you Lynne. Yay for the spring and yay for another Lilou dress! Thank you! What's not to love about Spring and new dresses!! Another gorgeous dress and I love that fabric! Thank you! I'm really glad I bought the fabric because I love it too.